Control valve is a fundamental component of any process. It is a type of final control element, which is a crucial instrument used to control different process parameters like flow, level, temperature, pressure etc. A process consists of various loops which may or may not be dependent on each other. Each loop is expected to maintain a specific value of the process parameter passing through it. This value may be defined while designing the process or may be provided by the operator in real time or may be obtained from some other process variable in another loop. We call this value as Set Point of our loop and we need to maintain the value of our process variable at this set point. To maintain this set point we may need to reduce or increase the value of our loop's inputs or outputs in order to nullify the error by altering the Process Variable (PV). This value is defined by the Controller. 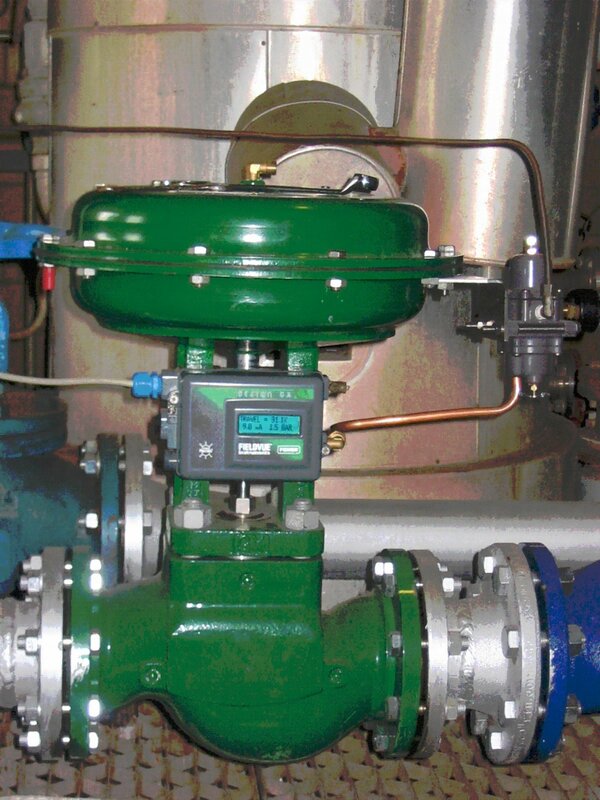 The controller processes the error and sends the signal to control valve. This action of controlling the process variables on receiving signal from a controller is done by a final control element called Control Valve. This PV value is sent to the controller. The controller also receives a value from the operator. This is the expected value of the parameter and is known as Set Point (SP). Any deviation of PV from SP results in an error. The controller is responsible to minimize the error and it does so by sending a signal to partially or completely open the control valve concerned with the value of parameter in the process. The opening and closing of the valve changes the PV value of the parameter and brings it closer to SP, thus reducing error in the process.Hence the control valve plays a crucial role in smooth functioning of a process. Control Valve is sometimes termed as Final Control Element as it is the final element in a control loop. The opening and closing actions of control valves are initiated by equipment known as actuator. Actuators can be of electrical, pneumatic or hydraulic type. They receive the manipulated signal from the controller and initiate the mechanical movement of the valve parts, thus resulting in opening or closing of the valve. Opening and closing of the valve is controlled by positioners based on electric or pneumatic signals. 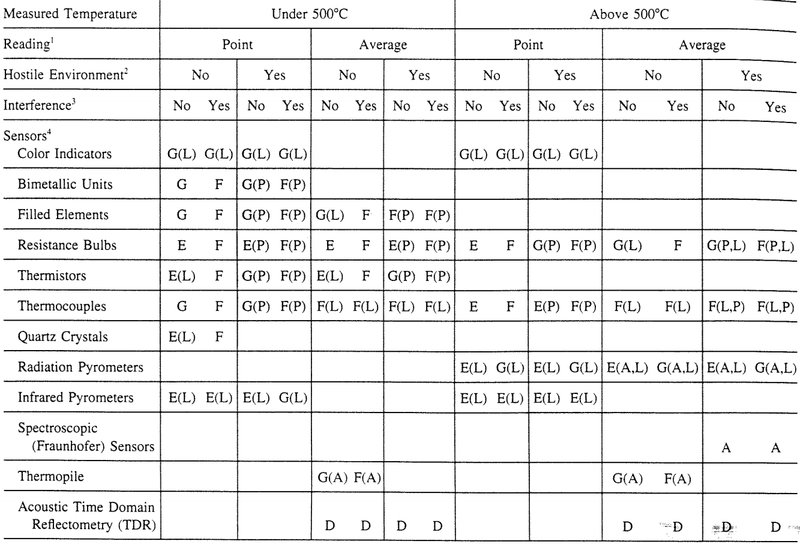 The most important criteria for selection of temperature sensor is its required range. The range in temperature within the universe varies from zero of black space to that of nuclear fusion deep within the stars which corresponds to billions of degrees. But the practical range on earth can be considered from 1 deg. R to 20,000 deg.R, which is tremendous and cannot be covered by a single sensor. Therefore, one of the restrictions on temperature sensors concerns the temperature range over which it can stay reasonably accurate. From range, we can shortlist the available sensors that can be used for our applications. After range there are various other more or less equally important criteria like accuracy, uncertainty and cost. Inspecting these briefly, the user can determine if the sensor meets his requirements or not. Thus we can finally select the sensor which suits best for our applications. Sometimes, we may face a situation where are constraints are too harsh and we are unable to come down on a single sensor for our application. In such a scenario, we may need to relax a few constraints which might not affect the process or measurement in a significant way. With a vast variety of available sensors, though, such a situation rarely occurs. When we finally decide the type of sensor we may need to study its further classifications and its available variations and the description of design in detail. If some of the features are unacceptable to the user or the process, we may need to change our choice. Temperature sensors should be selected to meet the requirements and limitations of specific applications. The parameters which the applications demands like temperature level, nature of information required (point or average temperature) and the nature of process environment should be determined. The most difficult temperature measurement applications are those where high temperatures are to be detected within a hostile environment, such as that which exists within a fluid-bed coal gasifier. By referring the table below, we can get closer to the type of sensor we desire. Source: Process Measurement and Analysis, B.G. Liptak. A: Detects the average temperature of an area. For example, G(D) refers to a device which is a good selection for a particular application, but it may not be commercially available or may be rarely available. The table must be read as follows. First select whether the requirement is a point measurement or an average of multiple readings, which needs to be taken sometimes for better accuracy or for constantly changing readings. Next check whether the environment in which the sensor or the instrument on which it is located is a part of hostile environment. Hostile environments refers o the processes such as fluid beds, where the sensor may need to face mechanical impact of high velocity solid particles. Then we need to check for thermal interference if any. It may occur due to thermal refractories or temperature differences between the carrier gas and the solid particles it contains. For further analysis like span, accuracy, cost, stability, we need to study and understand the classification of each of the above classes as they vary with each type. Orifice plate is a restriction formed in the flow by placing a plate in the pipe at the position where flow needs to be measured. The orifice plate has a opening smaller than the diameter of the pipe. Through this opening the fluid is made to flow. 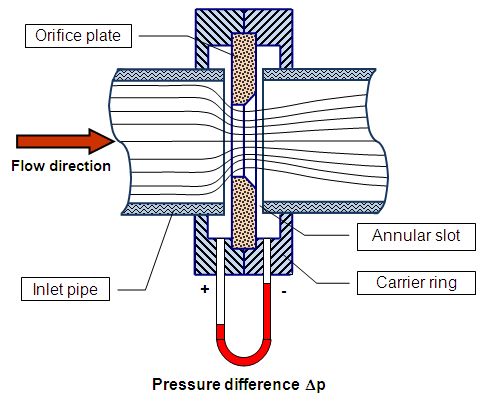 The pressure difference across the plate is proportional to the velocity of fluid flowing through the pipe. The image below shows the installation of orifice plate. The material of construction of orifice plates is generally Nickel, Phosphor or Bronze. Their thickness typically varies from 3mm to 12 mm, although plates of larger thickness can also be used. It has a circular opening with its center located at the axial center of the pipe. It also has a circular opening similar to concentric type. However its center is located just below the axial center of the pipe. Only a small part of the plate needs to be present between the opening and the pipe. 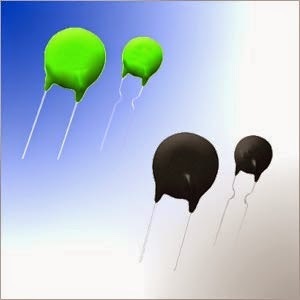 Eccentric type of orifice is preferred for fluids containing dissolved gases in large quantity. Its opening is not completely circular; but a segment of the circle. Its center is concentric with the axial center of the pipe. This type of orifice plate is used for fluids which contain solid particles or dirt. A concentric type of orifice plate is shown in the image below. The smaller image besides it shows a Differential pressure transmitter (DPT)﻿ installed across the orifice plates. Flow is nothing but the quantity of fluid passing through the section from which it is measured in a given period. Flow sensors or flowmeters are the devices which measure this quantity. Some flowmeters measure the amount of fluid passing through the section in the given period ( like 100 gallons per minute), while some other flowmeters are designed to measure just the quantity of fluid passing through the section (like 100 gallons). Flow meter, basically, consists of a primary device, a transducer and a transmitter. The transducer senses the fluid passing through the primary device and the transmitter converts the signal received from the transducer to a standard transmission signal. If Re < 2000, flow is laminar. 2000 < Re < 4000, flow is transitional. Re > 4000, flow is turbulent. 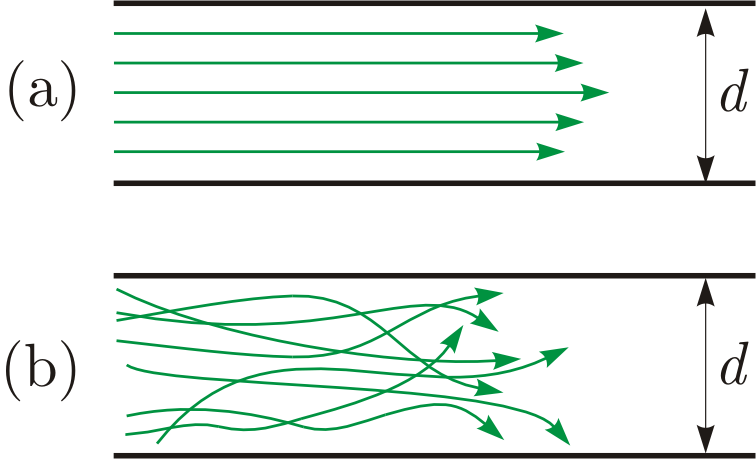 The image (a) shows a laminar flow in a pipe of diameter d, while image (b) show turbulent flow. Transitional flow is nothing but the flow when the turbulence has just started forming in the fluid flow. The Bernoulli's principle states that for an ideal fluid, an increase in the flow velocity of fluid results in a decrease of that fluid's pressure. An ideal fluid is a fluid assumed to have practically no viscosity.This principle is widely used by various volumetric flowmeters. Its derivation is based on law of conservation of energy. Different types of flowmeters are available depending upon the principle used for measurement. This type of flowmeters operate on the principle that a restriction in pipeline of flowing fluid produces a differential pressure across the restriction element which is directly proportional to the flow rate. The strain gauge is a piezoresisitve element which changes its resistance on application of pressure. This change of resistance is proportional to the strain applied on it due to the pressure change. So basically, it uses a property of materials(wire,foil or a film) that they tend to change their electrical resistance on applying pressure. The electrical resistance of an material is directly proportional to its length and inversely to its cross-sectional area. This implies that when a tensile deformation or stretching of material takes place its electrical resistance increases as its length increases and cross-sectional area decreases simultaneously. Consecutively, if it is compressed, its electrical resistance decreases. This change in resistance is very small. A Wheatstone Bridge network can be used to sense its resistance change. 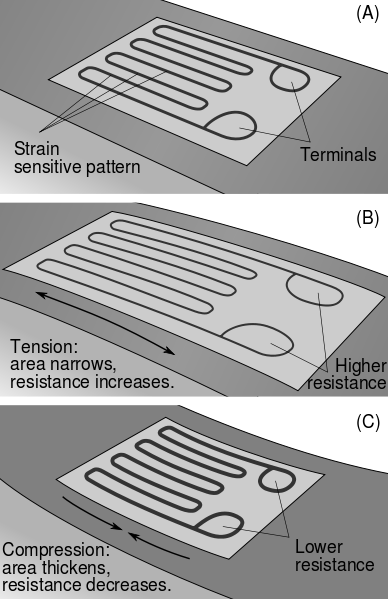 Typically, a strain gauge houses a zigzag pattern or parallel lines of a conductor in an insulated flexible backing as shown in the image above. This arrangement of conductor facilitates multiplicity of the applied strain over the effective length of the conductor in a small area. Earlier, metals were used as strain gauge elements. Many metals exhibit good strain characteristics within their specified elastic limits. However, they are subject to fatigue after frequent cycles of tension and compression. They also start 'flowing' or showing plastic deformation when subjected to strain beyond their elastic limits. This is a common problem in metallic band strain gauges. Nowadays, these metal band strain gauges are replaced by silicon ones which have higher fatigue resistance and high linearity. Another major advantage of silicon is seen in actual applications when a sensor fails, it needs to be replaced unlike the metal ones which continue functioning in that state. The strain gauge is attached to the object whose strain needs to be measured using suitable adhesive. There are various types of strain gauges. The one shown in the image above is a foil type bonded strain gauge. The one shown in the image below is the wire type bonded strain gauge. In bonded strain gauges, the thin ware or the foil is connected to a paper tissue or a thin film support. An unbonded strain gauge is the one in which a resistance wire is stretched an attached between two insulated points placed on the ends of two different attached but non-coplanar frames which can slide on each other when subjected to tension or compression. When motion occurs between the two frames due to force, the strain on the resistance wire changes, thus changing its resistance. The types discussed above were all uniaxial strain gauges. Another two types of strain gauges are biaxial and triaxial. 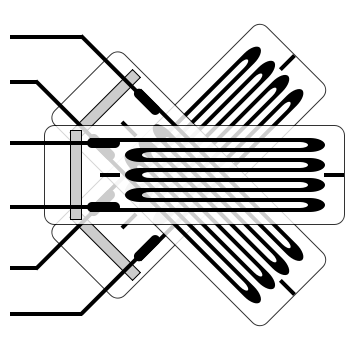 The biaxial type uses 2 strain gauges and can be used to measure strain in 2 directions, mostly in 90 degrees. The triaxial type of strain gauge can measure strain in 3 direction and uses 3 strain gauges mounted in 45 deg. or 60 deg. as per requirement. This type of strain gauge is used in applications where we need to identify magnitude as well as direction of the strain. The image below shows a tri-axial strain gauge mounted in 45 degrees. The thickness of these types of strain gauges is around 0.2 mm. An excitation voltage is required for the working of the strain gauge circuit, which is typically 5V or 12V. This voltage is applied to the input terminals of the Wheatstone's Bridge. Output Voltage, which is in the range of a few millivolts is taken from the output leads. An amplification and offset circuit is needed to get the reading accurate. This section presents a number of considerations that should be viewed in selecting a transmitter. They include functional specifications, performance specifications, material selection and desirable features. Also included are the definitions of these specifications and the relationship to functional and performance requirements. Both the maximum process and ambient temperatures need to be considered. 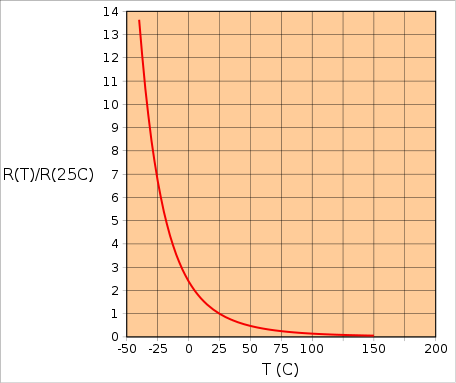 Often the process temperature will exceed the limits of the sensing element. The sensing element of most electronic pressure transmitters will not operate properly above 225° F(107° C). This will require the use of good impulse piping practices to get the transmitter temperature back within operating limits. High ambient temperatures on solid state electronics adversely affect component life. Most electronics are not rated for service above 200° F (90°C) and there are many components with a 185°F (85°C) rating. High temperatures tend to cause more electronic failures. Again, it is good engineering practice to keep the electronics package as cool as possible. Winterizing, either by steam tracing, electrical heaters, or heater controlled enclosures may also be a consideration. Both the operating pressure range and the maximum pressure should be considered. Gauge pressure transmitters should have an over-pressure rating of at least 150 percent of the maximum rating operating pressure with no other ill effect than having to re-calibrate. The minimum pressure should be also be considered. As part of the normal operation, a vacuum may be applied. Many transmitters have to be ordered special to obtain this capability.On differential pressure transmitters, over-pressure may be accidentally applied to either the high or low side of the unit when a three-value manifold is not sequenced properly. High over-pressure capability eliminates a possible shut-down while the unit is being re-calibrated or repaired. The static line pressure for differential transmitters should also be called out. Units are available on the market with standard line pressure capability from 500 to 6,000 psi. The transmitter should be capable of operating in environments with 0 to 100% relative humidity.The working fluid and the ambient environment should be considered for corrosiveness. For instance, transmitters used on offshore oil rigs are subject to corrosion from salt water. Another example is a transmitter in a steam or cooling water system in the vicinity of acids or bases that tend to get into the atmosphere. The above applications have a non-corrosive working fluid, and a very corrosive ambient environment. The Williams-Steiger Occupational Safety and Health Act of 1970 (OSHA), Subpart S, Electrical Considerations, has been in effect since 15 February, 1972. The purpose of OSHA is to accelerate the adoption of national standards for occupational safety. The Act given the Secretary of Labor two years to promulgate the adoption of such standards. All electrical instruments or electrical equipment used in hazardous locations must now be approved. Equipment or an installation is acceptable to the Assistant Secretary of Labor, and approved within the meaning of Sub-part S if it is accepted, or certified, or listed, or labeled, or otherwise determined to be safe by a nationally recognized testing laboratory, such as, but not limited to, Underwriters Laboratories Inc. and Factory Mutual Engineering Corp. Locations in which hazardous concentrations of flammable gases or vapors exist continuously, intermittently, or periodically under normal operating conditions. Locations in which volatile flammable gases are hazardous liquids, vapors or gases will normally be confined within closed containers or closed systems from which they can escape only in case of accidental rupture or breakdown of such systems or containers, or in case of abnormal operation of equipment. Locations which are hazardous because of the pressure of combustible dust. Location in which easily ignitable fibers or materials producing combustible flyings are present. Atmospheres containing hydrogen or gases or vapors of equivalent hazards such as manufactured gas. Atmospheres containing ethyl ether vapors, ethylene, or cyclopropane. Atmospheres containing gasoline, hexane, naptha, benzine, butane, alcohol, benzol, lacquer solvent vapors, or natural gases. Atmospheres containing metal dust, including aluminum, magnesium, and their commercial alloys, and other metals of similar hazardous characteristics. Atmospheres containing carbon black coal or coke dust. Atmospheres containing flour, starch, or grain dusts. Explosion-proof enclosure means an enclosure for electrical apparatus which is capable of withstanding, without damage, an explosion which may occur within it, of specified gas or vapor, and capable of preventing ignition of specified gas or vapor surrounding the enclosure from sparks or flames from explosion of specified gas or vapor within the enclosure. To make a system explosion-proof, the enclosure must be capable of withstanding an explosion, and the system must be installed per national electrical code for hazardous locations. Intrinsically safe equipment and wiring are incapable of releasing sufficient electrical energy under normal or abnormal conditions to cause ignition of specific hazardous atmospheric mixture. Abnormal condition will include accidental damage to any part of the equipment or wiring, insulation, or other failure of electrical components, application of over-voltage, adjustment and maintenance operations, and other similar conditions. Several advantages to the intrinsic safety approach are listed below. These advantages have to be weighed against the initial higher purchase price. Today it is estimated that 60 percent of these types of installations are classified as intrinsically safe. · Less operator-dependent to maintain a safe system. · Easier to maintain and repair. · Accessible to repair without special precautions before opening the unit. In some applications, pump or other process noise pulses must be dumped out to get good control or indication. The more unit is damped , as specified by the corner frequency, the slower the response time. In other cases where the system dynamics require fast transmitter response for best performance. A review of the specific application is necessary to determine the requirements for adequate performance. However, in most cases this is not a serious problem. 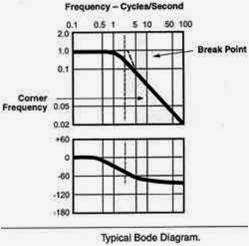 Damping is defined in terms of corner frequency or "time constant." Corner frequency is the junction of two confluent straight line segments of a plotted curve (see Figure 7). For the output of a first order system forced by a step or an impulse, the time constant is the time required to complete 63.2 percent of the total rise or decay. The standard output for two-wire transmitters is 4 - 20 mA dc or 10 - 50 mA dc. There are also four-wire transmitters that can provide zero-based voltage signals. The most common is 0 - 5 V dc.Three-wire transmitters are also available, which can provide a 4 - 20 mA dc, 10 -50 mA dc, or zero-based signal. Zero Elevation-for an elevated zero range, the amount the measure variable zero is above the lower range value. 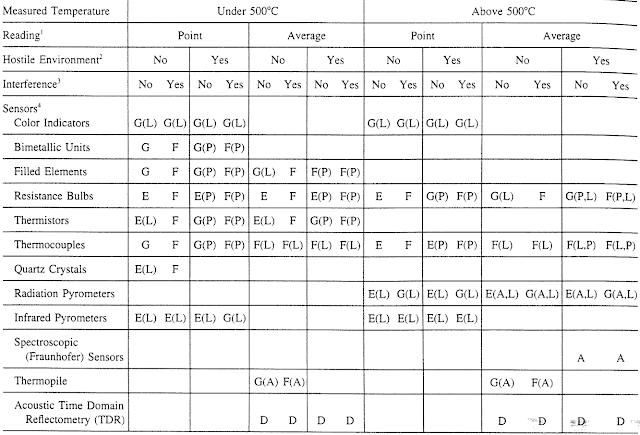 It may be expressed either in units of measured variables or in percent of span(see Table 1). Zero Suppression-for a suppressed zero range, the amount the measured variable zero is below the lower range value. It may be expressed either in units of the measured variable, or in percent of span (see Table 1). Gage pressure ranges are usually expressed in pounds per square inch gauge (i.e., 0-100 psig). The range may have a suppressed zero (i.e., 50 to 100 psig), or it may be a compound range (i.e., 20 in Hg vacuum to 50 psig). Absolute ranges are usually expressed in inches of mercury absolute or psia (i.e., 0-30 HgA or 0-100 psia). The most common range with a suppressed zero is the barometric range (i.e., 28 to 32 in HgA). The choice of a power supply for two-wire transmitters will depend on the load. Most transmitters are capable of operating over a wide range of load limits (see Figure 9). Wiring should consist of twisted pairs. Most transmitters do not require shielding, but it is recommended to eliminate noise pickup from electric motors, inverters, or other noise generating electrical equipment in the area getting into the receiver. The size of the wire is usually not critical; 18-gauge is usually sufficient. The resistance of the wire adds to the total load, and in most cases simply requires a power supply of sufficient voltage to handle the entire voltage drop across the system. Special considerations should be given when using computers, especially where sampling times are short. Electronic transmitters often have internally generates driving frequencies, which may show up as high frequency noise on the output.As an example, assume the sample time in 85 microseconds, and assume some 50 kHz frequency noise on the line, which would have an equivalent period of approximately 6.4 microseconds. The integration time to average out this noise is only 13.4 cycles. This does not allow enough time to completely integrate a high level noise. If it is significantly high, a filter should be considered. As shown in the image above, the diaphragm is subjected to external pressure. It thus expands and contracts as the pressure changes. 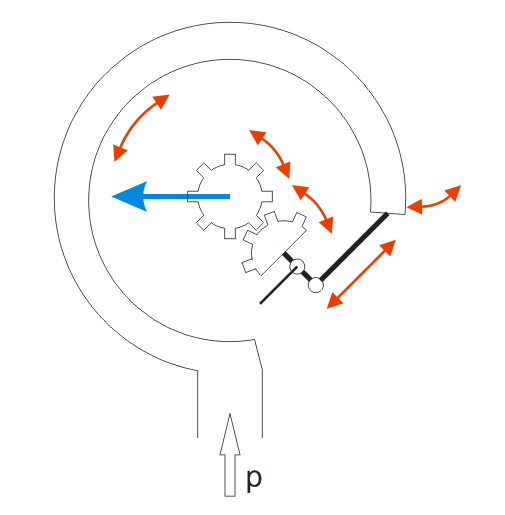 The displacement of the diaphragm result in motion of the gear which moves the indicating needle on a scale. The scale is calibrated in terms of pressure units. In this case, we have used a mechanical assembly. We can also use electrical displacement sensors like LVDT or Piezoelectric crystal, which can measure the displacement of diaphragm with higher accuracy. Diaphragms can be used only for pressures below 400 psi. Brass : For low pressure measurements. Beryllium Copper: For medium range process. SS316: For corrosive fluids and high pressure measurements. Depending upon pressure ratings and fluid compatibility, various other materials like monel, tantalum, titanium, various other SS grades are also used. Seals the process. Therefore, no leakage problems. Processes where purity is important. Diaphragm isolates the sensor whose metal parts can contaminate the fluid with ionic reactions. e.g Food, pharmaceuticals, chemicals, etc. Pneumatic processes where proper sealing is necessary. Diaphragms used for pressure measurement are sometimes also known as diaphragm seals, since they isolate the secondary transducer from the process fluid. Bourdon Tube is one of the most widely used sensors for Static pressure measurement. The basic principle behind this sensor is that elastic materials tend to inflate or deform their shape when subjected to a force. The fluid whose pressure needs to be measured is made to exert force on this elastic material. The elastic material is a thin-walled metal tube bent in the shape of the letter 'C', with one end fixed open to external pressure and the other end is closed and movable. This tube is known as the Bourdon tube. 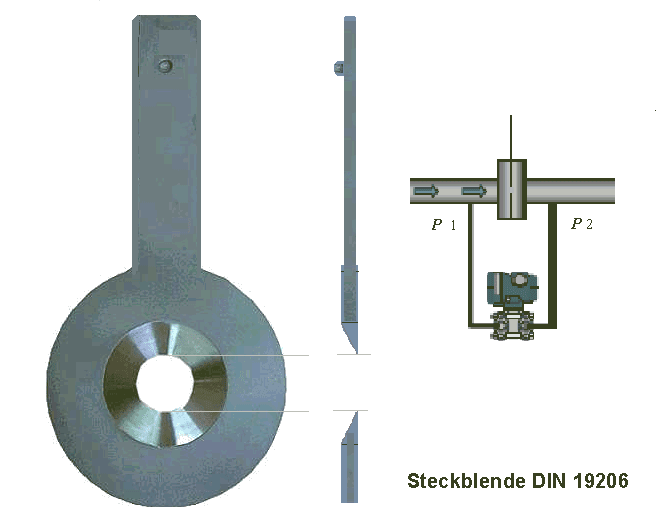 The image below shows a C-type Bourdon Gauge. 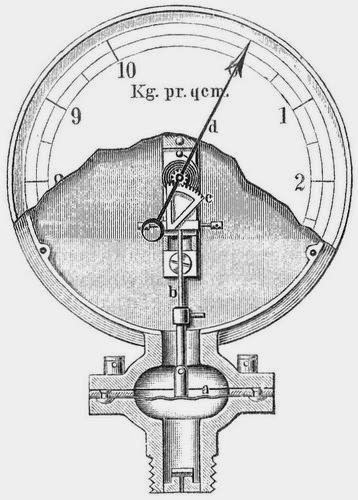 The working of the Bourdon Gauge is as shown in the above image on the right side. When pressure is applied, the closed end of the tube starts deforming from is 'C' shape and tends to straighten. The closed end is attached to a lever system that magnifies the motion of the tube using gear system. The magnified output deflects a needle on a pointer. The scale is calibrated in pressure units. The deflection is proportional to applied pressure when calibrated. Its calibration can be done using Mercury Barometer. The motion of the bourdon tube can be alternatively attached to a strain gauge to get output in the form of electrical voltage. Thus, the output can be displayed digitally using a signal conditioning circuit. Now let us have a look at the different parts of the mechanical assembly attached to the Bourdon tube. 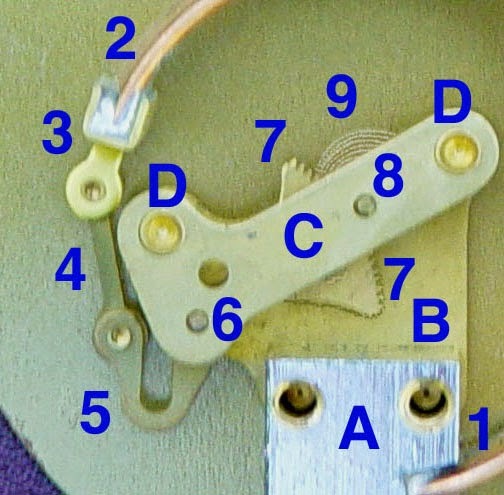 A: Receiver part. This part joins the pressure inlet to the fixed end of the Bourdon tube. B: Chassis plate: It has bearing holes for the axles. C: Secondary Chassis plate: It supports outer ends of the axles. D: Space for joining the two chassis plates. 1: Stationery end of Bourdon tube. 2: Moving end of Bourdon tube with sealing. 3: Pivot and pivot pin. 4: Link joining pivot pin to lever, allowing rotation. 8: Indicator needle axle. It has a spur gear that amplifies the motion of the tube, before passing it to the needle. 9: Hair spring to preload the gear train and eliminate gear lash and hysteresis. The Bourdon Gauge has threads below it which makes it easy for installation on pipes. The Bourdon Gauge can be used for measuring vacuum as well. Such gauges are calibrated as 0-30 in Hg. or 0-760 mm Hg. In such case, the needle moves clockwise on increasing vacuum. Such gauges can even be calibrated as 0-1 bar, where the needle moves anti-clockwise on increasing vacuum. The latter proves beneficial when a single gauge needs to be used for measuring both, pressure and vacuum. 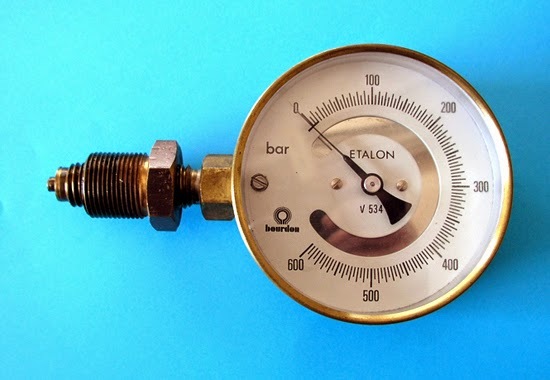 Bourdon Gauges with Brass connections and Phosphor-Bronze tube are suitable for use in air, water, oil and other fluids compatible with these materials. These materials are generally preferred for non-corrosive and low pressure applications (400 psi). For non-corrosive and medium pressure applications, Beryllium-Copper tubes are used (6000 psi). For high pressure applications, SS316 tubes are preferred (80,000 psi). For corrosive fluids and for use in corrosive environments, SS403 tubes must be used. When used for steam, a syphon should be fitted and filled with cold water prior to use. When the Bourdon Gauge needs to be used in conditions subjected to severe vibrations, we need to use liquid filled Bourdon gauges. The liquid helps to damp down oscillations and also lubricates the gauge. Medium to very high pressure applications. Can be used for air, water, oil, steam and corrosive fluids as well. High Accuracy: Generally +2% of span. They can even be manufactured for accuracies ranging to 0.1% of full scale. Safe for high pressure measurements. Can be modified to give electrical output. It is a portable device and installation is easy. Cannot be used for dynamic pressure measurements as its response to changing pressures is slow. It can even malfunction if pressure is varied rapidly. Cannot be used in very high temperature applications. It also needs to be mounted away from heat sources. Cannot be used for high precision measurements. Sensitive to shock and vibrations. They are subjected to hysteresis.